"The most important word you use is why!" 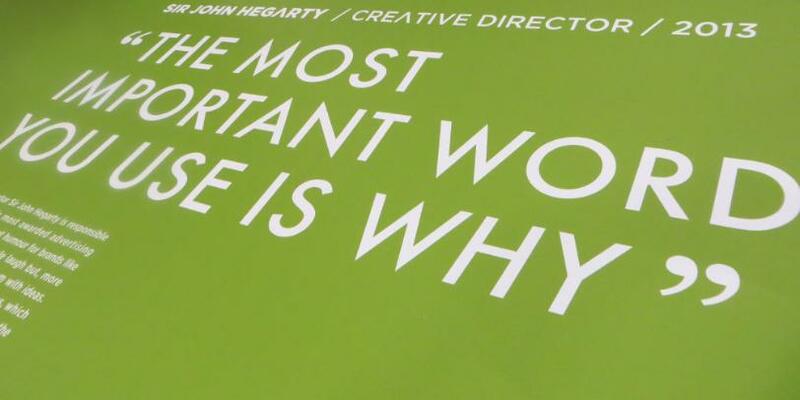 That’s was what Sir John Hegarty told the crowd at an inspiring presentation that I was lucky enough to attend back in 2013. In my role as creative director, I get to brief in the design team. It's important to ensure that everything that goes through the studio is the best it can be. I have to mentor and up skill young designers and I always love to watch how they respond to briefs. Many designers sketch out ideas, others go straight to their computers. Without a doubt, Google is one of the most incredible inventions of our time, yet still, one of my pet hates are designers going straight to Google without an idea. I've been known to not let designers on a computer until I first see an idea. After a brief discussion regarding a couple of the finer points of the project, I asked her to look out of the window. I asked why are those power boxes across the road painted grey? The bushes that surrounded them were green and I couldn't help to notice the stark contrast. My team often has the tendency to look at me like I'm crazy. I mentioned that everyday we simply take all around us for granted. We look but we don't really see. I told her to do this with the project. I needed her to ask why? Our roles as designers are to get to the core of the task and to find a simple answer and to never offer the obvious. Asking why and seeing differently is what makes us designers. Testimony to this was when I returned back to her desk an hour later to find the most incredible, intellectual and different work... Neither of us knew why those bloody power boxes were painted grey though!